This is the third volume in the three part set is chocked full of even more details and drawings to help with your MB/GPW needs. 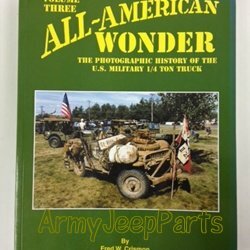 ALL AMERICAN WONDER Vol III, The photographic History of the US Military 1/4 ton truck, by Fred Crismon. This is a great book full a great photos. The first half or so of the book cover the WWII jeep. The second half cover all post war versions of the jeep up to and including the Hummer series. There are a lot of proto types show too. This is a must have for any jeep enthusiast. Over 600 pages.